When I was younger, I was judgmental about the use of anti-depressants. I thought that unless you were so depressed that you couldn’t get out of bed, taking anti-depressants was a cop-out, a refusal to engage with your own darkness. When a college friend started taking them, I was disappointed in her. I thought she was depriving herself of an essential part of the human journey, that facing whatever arose unadulterated was part of what was required to season the soul. My story looks something like this: At the age of twenty-seven, I returned from a year in West Africa to the sudden sensation that I was old. I was gripped by a sense of narrowing options that sent me into a mad fear panic, first about my career as an actor and writer, and then even more intensely about my personal life. I’d known I wanted children since I was a child myself, but until that moment I’d placed them in some vague future in which I miraculously re-formed as an adult. Now I felt the moment was upon me and rapidly slipping past. I had to identify a partner, cultivate a relationship—which I knew could take a year or two from the moment of identification—and get pregnant before time ran out. Unfathomable as it seems from where I stand now, at not quite twenty-eight years of age I was convinced that I had to find a partner ASAP if I had any hope of bearing a child. I kicked my social life into high gear. I’d always enjoyed flirting, and I was surprised to discover that I’d developed the capacity to attract a wider range of men than I had when I was younger. Dating became my part-time job. As long as I was more curious than smitten, I stayed light on my feet and my dates were charmed. But the moment I decided someone was a serious candidate for life partnership, everything changed. I became a walking panic attack: I had trouble breathing, sleeping, getting up in the morning and moving through my day. I was so petrified the relationship would end that I couldn’t bear to stay in it. Without consciously intending to, I’d escalate some minor conflict or misunderstanding into high drama to get myself out. When the relationship ended, I’d grieve wildly, then gradually calm down and regroup. I’d develop a narrative about why he was the wrong person and re-start my search. This pattern continued for about seven years, through a series of relationships lasting from a few months to a year. I went to therapy until I could no longer stand to hear my own stories. I began studying Buddhist philosophy and meditation in an attempt to ease my suffering. And although I tell the story now with a sense of remove, there was nothing removed about it at the time. Each loss was an unraveling, the grief savage and bottomless. It was as if, with each breakup, I watched my entire future—a future of love, family, and stability—burn up and disintegrate before my eyes. I remember days, weeks, of crying all the time, every moment of the day until it was time to go to the theatre. Then I’d leave my room and walk down the hall to the bathroom, wash my face, get in the car, drive, warm up, put on makeup, walk onstage, perform, then go back home and do it all again the next day. In between there were wild, stretched-mouth hours of silent howling, my face smashed into a pillow so my roommates wouldn’t hear. I remember drawing light razor tracks on my arms, the suspended moment before the bright dots of blood bubbled up, the household medications lined up on my bedside table, taunting me, I dare you, I dare you, as I lay in bed at night, eyes open, crying and drifting and waking to cry some more. I remember the moment I decided to try medication. I was in Seattle, walking down the hill from my apartment to the theatre, where I was doing a five-week run of my solo show, Let My Enemy Live Long! 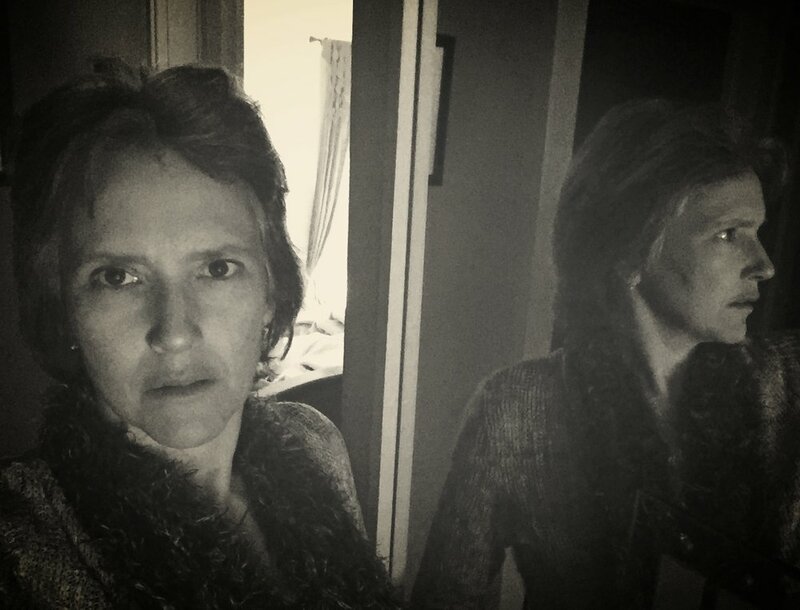 The night before I’d sat before the bulb-ringed mirror in my dressing room and wondered why I felt so blank. Despite the fact that I was doing exactly what I wanted - making an actual living performing my own work at respected venues to glowing reviews and appreciative audiences—I was unable to access any kind of joy. Walking to the theatre the next day, I remember everything as gray – the sky, the buildings, the streets, even the trees. I was gray, too. I’d known extreme emotion all my life, but this numbness, this sense of nothing-at-all, was something new. That’s when I thought, I’ll do it. I love Buddhism and meditation, but it’s not enough. I’ll see what Western medicine has to offer. When I started taking Zoloft, I felt as though my darker emotions were swathed in a layer of protective felt. They were still there, but their corners were blunted, their edges softened. In my earlier life, when I craved the knife’s edge of existence, I would have resented that softening, but not anymore. On the contrary, I felt wave upon wave of relief. I’ve been on Zoloft for seventeen years now. Ten years ago I drafted an essay about my journey toward medication for an anthology of stories about the changes women go through in their thirties, but my editor—understandably enough—didn’t want a story in which medication was the hero. She preferred another story I'd written, about how my eventual quest for single motherhood unexpectedly yielded a man. But truly, without the medication, there couldn’t have been the man. Oh, I’m sure there would have been men—there always were—but without medication, there would not have been the me who stayed. Another way to put it is that sometimes I think anti-depressants made my current life possible. Other times I know they did. Several years before I started taking medication, I sat with my Buddhist teacher, James Baraz, in a small office at Spirit Rock Meditation Center, sobbing over lost love. James told me that deep grief carries a gift. The gift, he said, is compassion—the capacity to feel the world’s bottomless sorrow, both cumulatively and in each individual. In learning to sit with my own sadness, he said, I would learn to hold the sadness of others, and this holding would become a precious use for my sorrow in this world. Now, leading writing workshops, I have the opportunity to put that theory to the test. As I sit with people in a circle which I hope is wide enough to embrace the spectrum of human experience, I call upon my capacity to hold it all with clarity and compassion – the joy, the sorrow, the vast contradictions inherent in each of our lives. I’m now twice the age I was when I judged my young friend for taking anti-depressants. My days of judging people for getting whatever help they need to hold their lives with grace and equilibrium are long gone. And so I sit and write with my fellow humans—breathing, listening, naming things just as they are, and inviting them to do the same. What's your story? Off-Leash Writing helps you to name things exactly as they are. I'll be teaching in person this summer in Berkeley, California, June 23 - July 14. REGISTER HERE, or SUBSCRIBE to be notified of future in-person and online classes.